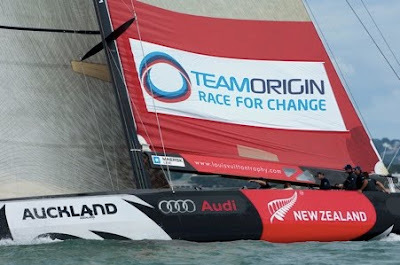 TEAMORIGIN have now been down in Auckland since 22nd February and are in the final throes of preparation for the Louis Vuitton Trophy Auckland Regatta. Training days take place on Sunday 7th and Monday 8th March and racing starts on Tuesday 9th March. The initial round robin happens between Tuesday 9th March until Monday 15th March, followed by 2-3 days elimination rounds, semi’s and then the Louis Vuitton Finals on Sunday 2st March. The Match racing team of Ben Ainslie, Iain Percy, Mike Mottl, Zac Hurst, Julien Cressant and Matt Cornwall are this week competing in the Omega Match racing event and headed up the leaderboard after day one with 6 wins and 2 losses. There was no racing today due to too much wind. Racing resumes tomorrow. Racing can be followed on http://www.teamorigin.com/ (we will post a live blog during racing, a link to enable you to watch racing online and will also issue daily updates, photos, videos and news from the team. Sky Sports in the UK will show the daily highlights programmes – we will post times when we have them.